Anna Sheffield for Target jewelry launches today! Preview the collection here. 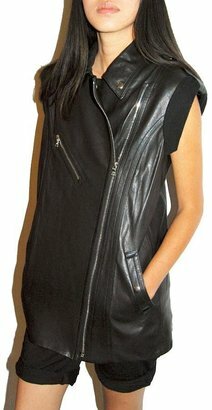 Alexander Wang's highly-coveted black leather moto vest, as seen on the S/S 2009 runway, costs a whopping $1,036 on sale at Satine. To get the look for yourself this fall, try this faux leather moto vest by Xhilaration, just $19.99 at Target. When I shop at Kohls, I usually hone in on the Simply Vera Vera Wang and ELLE collections, but I received some images from the Mudd Fall Lookbook which I thought I'd share in case there are some Mudd fans out there. This juniors label is a great source for fall plaid, denim, and tees at really low prices. If you're a fan of pricier labels such as Lucky Brand (sold at Nordstrom, Bloomingdale's and Macy's) which has a similar boho, peace-signs-and-seed-beads aesthetic, you might want to check out Mudd for some affordable looks-for-less, too, especially their jewelry, scarves and other graphic tees. Any thoughts on Mudd? Wal-Mart is rolling out a new line of cosmetics by Hard Candy this September which will range in price from $5 to $10, or $6.40 on average, reports WWD. "The new line consists of 261 items ranging from shimmer lip glosses (Plexi Gloss, Lip Tattoo), baked eye shadow duos (Kal-eye-descope), glitter liquid eyeliner (Walk the Line), volume mascara (Ginormous Lash) and eyeliner pencils that double as hair sticks (Take Me Out Eyeliner)." I'm old enough to remember when Hard Candy, in all its glittery glory, was cool (and out of my budget). I'd like to think I'm over it but watch me get all giddy when I see it in stores. Are you excited to see Hard Candy come to Wal-Mart? I've already received a number of requests for cute, affordable coats—and the hunt is on! Or maybe, the search is over: Just feast your eyes on the elegant yet totally cool coat above by BB Dakota. It's functional, stylish and the price (for a coat, people) isn't that bad either. Thanks to the lovely Broke & Beautiful for turning me on to shopmapel.com, the fashionable boutique where you can purchase said coat for $78. Not a fan of the blue or need something other than a trench? Browse the BB Dakota offerings below. It's hard to pick just one, they are all so cute! And all under $100.